Region: This fly is found throughout the southern United States. 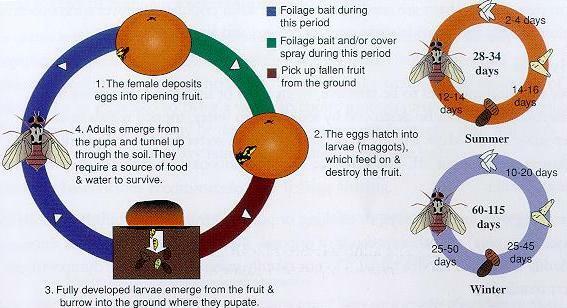 Life cycle: This insect produces several, 1 to 12, generations each year and overwinters as pupae or adults within the soil or in protected areas. Physical Description: This 1/4 inch long fly has a yellow abdomen, yellow and black marks on the thorax and yellow bold bars on the wings. The larva is white, legless and 1/4 inch long. They develop from white eggs laid in holes in fruit. 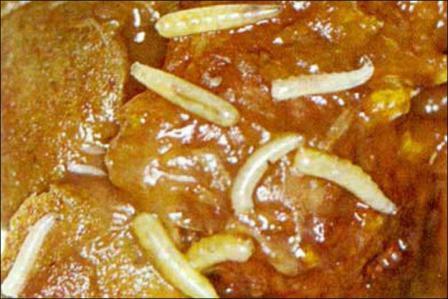 Feeding characteristics: This pest attacks many orchard fruit crops where the maggots borrow into the fruit pulp, causing it to rot. Controls: Adults should be the object of control, since once the eggs are laid the damage is done. 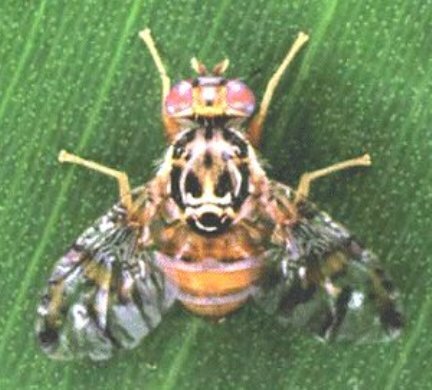 Spray with rotenone as soon as the flies appear, and repeat the spraying every 7 to 10 days if flytrap counts remain high. A trap can be fabricated by painting a 6 by 12 inch piece of plywood board a bright yellow. Mix the paint with a mixture of water and household ammonia, 50/50. Cover the board with a commercial sticky material and hang it 6 to 8 feet above the ground on the south side of the tree. For small orchards, use at least four traps. In larger orchards, hang a trap for every acre. The traps seem to work best when surrounded by foliage, and renew the ammonia and water bait each week, checking the stickiness every now and then. Cultivating the surrounding soil will also help by destroying the pupae, which overwinter within the top two inches of soil.